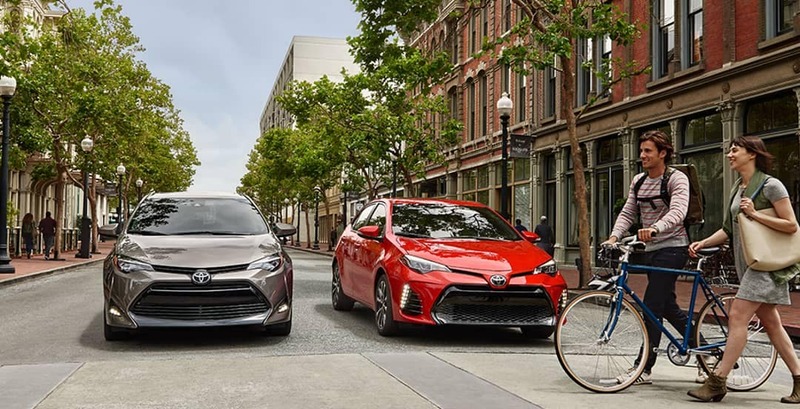 The Toyota Corolla has been a perennial favorite with critics and customers alike, and the newest model just may be the best release yet. The Toyota Corolla interior has been refined and modernized, providing all the conveniences and luxuries that drivers want. From Connected Navigation to the Smart Key System, this Corolla is brimming with state-of-the-art technology. But drivers will still enjoy the same practicality and comfort that has made the Corolla such a popular nameplate for so many years. Learn all about the latest features below, and then take a spin at Rusty Wallace Toyota! No need to fumble with keys to access your car securely. Use the optional Smart Key System with Push Button Start to click a button and go! Use the push-button controls to set the temperature of your choice, then use the dust and pollen filter to freshen up the air. This available multimedia bundle delivers tons of entertainment options on a 6.1-inch touchscreen display, along with voice recognition technology! Available with the Entune Premium Audio system, this built-in navigation system is strengthened with apps like HD Radio Predictive Traffic and Doppler Weather overlay. The Toyota Corolla interior was designed with adaptability in mind, along with plenty of technology to keep the drive interesting. This compact sedan seats five passengers comfortably with premium fabric or optional SofTex-trimmed seating. No matter which trim you select, you’ll love the adjustable settings that help you reach the telescopic steering wheel with ease. Options like USB 2.0 ports and 12V auxiliary power outlet provide a place to charge all of your electronics while on the go. What about those days when you over pack? No need to worry! There’s plenty of room in the trunk, but if you need more, fold down the 60/40 split rear seats to create extra room for long and bulky items. Given its versatility and well-appointed interior, it’s no surprise that the Corolla bests the competition like the Hyundai Elantra! Want to see why this sedan is such a smash hit? Visit Rusty Wallace Toyota for your test drive!